In 2020 or sooner, the Conservative Party will win the next general election with an increased majority. It will be a party in the hands of the state-shrinking, national asset-stripping, Brexiteering self-servers whom the Observer last Sunday described as “the most irresponsible, least trustworthy government in living memory”. Re-mandated, it will be able to complete the dismantling and sell-off of the ailing NHS and the privatisation of schools. Social care will become available only for the moneyed and insured. Daily existence for our children, our sick and our older people will become life-threateningly tougher and more precarious. Workers’ rights, consumer rights, even human rights will be in name only, as will environmental protections. Energy will remain dependent on fossil fuels, fracked and strip-mined while renewables rust. There will be no pretence at tackling climate change. Insurgent parties from the left, notably the Green Party, will be squeezed out of every poll and debate, spied upon and found wanting by an increasingly authoritarian, rightist state. And boundary changes will firmly cement the new reality. This is no dystopian fictional future. It is happening today: a further election win for the Conservatives would be its consolidation. And with the official opposition where it is, the only force that could deny the Tories another win is a Brexit so disastrous that the electorate rises up against its architects. But Theresa May knows the scale of that risk, which is why the next general election could well come earlier than 2020, before reality sets in. And that is why the Labour Party is on an election footing, despite its dismal prospects. The Labour Party was no match for this Conservative dominance in 2015. And now? Even if it improves on its 2015 performance in England, Labour now cannot win a general election outright while it has no potential in Scotland. But the SNP is not weakening and the Copeland by-election says Labour in England is not improving on 2015. Anything but. In January, a Fabian Society report titled Apocalypse Soon stated that “Labour has no realistic chance of winning an election outright” with analysis showing that “at the next election it is on course to win under 200 seats for the first time since 1935”. Earlier this month, the respected progressive think tank Compass stated “nothing short of a miracle is going to produce a parliamentary majority for Labour.” And that’s without the loss of Labour seats caused by new constituency boundaries. The resurgent LibDems have seized on Labour’s difficulties and its cack-handling of Brexit to claim they are now the home for disillusioned Labour Remainers – with some success. 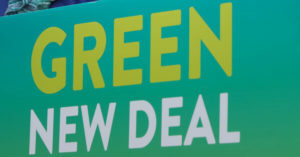 The Green Party could (should?) do the same for non-centrist Labour Remainers. But even with new support, neither of these parties will break through to major electoral success: they cannot because of the UK’s rigged electoral system, that will keep on giving the majority of seats to Conservatives and Labour in defiance of the popular vote. Step forward Progressive Alliances. Bottom-up, local, short-term electoral pacts between progressive parties in constituencies where such pacts can make a difference. An alliance can take many forms: in one constituency, it may be a written agreement between progressive parties to support a single candidate while in another it may simply be a tacit nod to reining back on campaigning – something that already happens quietly in many places. In other constituencies, an alliance might embrace “open primaries”, where progressive parties agree that the local electorate should directly select a single alliance candidate, to be respected and campaigned for by all. And an alliance might not just be between parties. It may be trades unions or community groups that stage open primaries, propose cross-party candidates, back single candidates or broker deals. Local Progressive Alliances offer a means of confronting our rigged electoral system. They don’t fix the system but, by reducing the number of candidates who will split the progressive vote, they can re-rig it in swing seats where the combined progressive vote is in the majority. By and large, these are the few seats that also actually decide the outcome of our national general elections; in these, local unity can change the national political landscape. According to non-party campaigning group Sussex Progressives, there were 48 such seats in 2015 – if just half of those had fielded single progressive alliance candidates, we could arguably not now have this wrecking ball of a government, Theresa May or Brexit. There is a price to pay. Progressive Alliances will deliver more seats to Labour and the LibDems than to the Green Party. And in some seats, Greens will find it hard to support – or, at least, not vigorously oppose – LibDem candidates who refuse to rule out future Tory coalitions. It isn’t easy and, in some cases, Greens may need to attach tough conditions to their support – a lesson to be learned from past pacts. But weigh up the alternatives. A few dozen local alliances have the potential to save the NHS, state education, social care, human rights, environmental protection, carbon reduction and more, even if the alliances are gruelling and some alliance candidates prove unworthy. Without alliances, meanwhile, there is nothing. Without Progressive Alliances, parties to the left of the Conservatives cannot win back the House of Commons. Period. Progressive Alliances are essentially local. They are not about national coalitions in government. So to dismiss them because of the impossibility of a national alliance in government between Scottish Labour and the SNP, as did David Morgan’s case against progressive alliances in Bright Green a few days ago, is to miss the point. If, after an election, a minority Labour government needs SNP votes to govern, that is a separate issue; it is not what’s being debated under the Progressive Alliance banner right now and it is not, for example, the subject of the Progressive Alliance motions being put to the Green Party of England and Wales Conference this coming Saturday, which are about pacts leading up to the next general election. 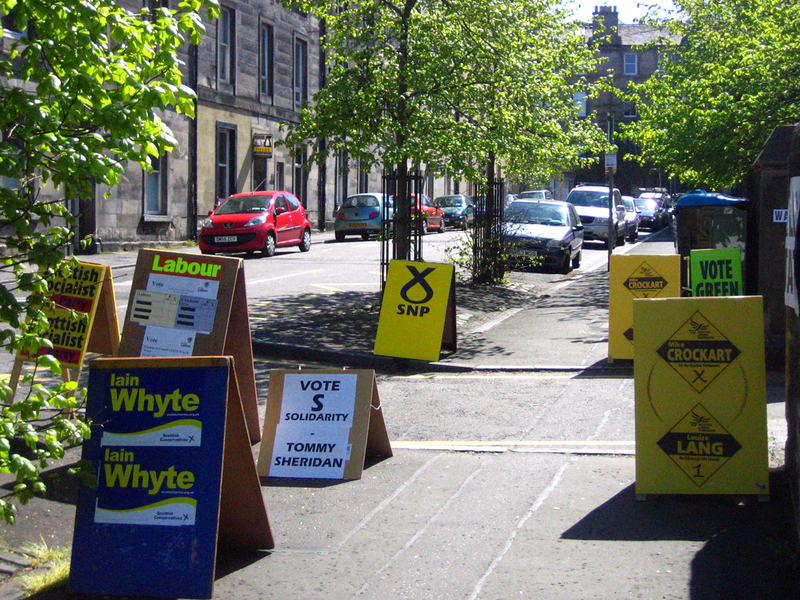 Dismissing local alliances because national parties seem uninterested is also a red herring. Nationally, Labour makes anti-alliance noises (a point I’ll return to in a moment) but locally things can be different. Labour parties have made local deals in the past and will do so again, and every party at every election concentrates resources on what is winnable and reins back on what isn’t. In particular, current experience suggests that local parties with Momentum leaderships are more amenable to talks about talks. They are that bit less tribal. But that said, there is a key role for national parties, because the bigger aim for Progressive Alliances is not just to de-rig local voting for one election: it is to undo the rigged voting system itself, by making PR – proportional representation – a condition of electoral pacts. A few dozen alliance-backed MPs cannot, on their own, successfully introduce PR, so there is a role for the national parties to support PR in exchange for local alliances. Essentially, this means Labour. For local electoral pacts to produce PR, national Labour has to acknowledge the plight it is in and accept PR as the price of becoming sustainable. In his Bright Green article, David Morgan states “The Labour party has absolutely no interest in a progressive alliance” and goes on to cite Tom Watson, John McDonnell and, to an extent, Jeremy Corbyn (though it is worth reading what Corbyn actually said and not the reinterpretations of a journalist trying to pad a short quote and subs looking for a headline). But is this the whole picture? 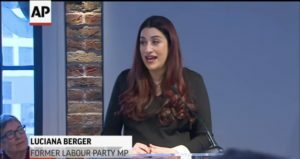 The Labour Party is not collectively against Progressive Alliances: it is having an internal debate about them and about PR. Clive Lewis, Corbyn ally and often mentioned as Corbyn successor, is firmly in favour, as are other Labour MPs. A strong cohort of Labour MPs openly backs PR, including John McDonnell and Clive Lewis plus Cat Smith, Stephen Twigg, Chuka Umunna, Stephen Kinnock, Jonathan Reynolds and many more. Attend any conference of Labourites and it’s clear that Progressive Alliances and PR are among the most discussed topics, on and off the main stages. The extremely influential Fabian Society and Compass, in the reports mentioned earlier, both argue vigorously for Progressive Alliances as Labour’s only hope. And whatever it may say in public, the Labour Party leadership knows the party’s frightening electoral prospects. Party leaders have to state their confidence in their own futures. They have to dismiss speculation about anything that implies they are in trouble. But they are also capable of seismic policy shifts when needed. In just a few days last summer, the Conservative Party transformed itself from Remain to ultra-hard Brexit. After decades of opposition to nationalised railways, Labour is suddenly, near-unanimously in favour of re-nationalisation. To the three establishment parties, electoral advantage is everything and policy follows electoral advantage. Labour has little advantage without electoral pacts. Nothing is guaranteed in politics. Every decision is a weighing of risks and opportunities. Right now, the Green Party of England and Wales’s best opportunity for the introduction of PR – and for seeing its number of MPs reflect its popular vote for the first time – lies with Progressive Alliances. And along the way, it might just help to save the welfare state, human rights and environmental protection. That, surely, makes pursuit of Progressive Alliances worthwhile. 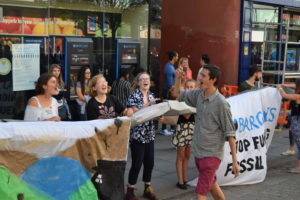 Rob Shepherd is a member of the Green Party and Compass, former chair of Brighton & Hove Green Party and former member of the party’s local and national communications teams, writing here in a personal capacity. Everyone needs to take a long hard look at their own parliamentary constituency and ask themselves: who is most likely to beat the Tories? Divided votes mean losing. We are on a war-footing. Think Mordor. Tolkien’s dwarves and elves distrusted each other -but when up against a great evil – we need to forget short term gains; and think of the Earth, and British society, – evolved over hundreds of years and being returned to robber-baron/serfdom status. The damage another term of Tory government will do will be irreversible. It will dismantle the Union; frack the hell out of the countryside; support nuclear power by subsidising energy companies who are on the verge of bankruptcy; and destroy the NHS. By pledging to get immigration down to 100.000, we will loose essential agriculture workers and need to import more, or turn the countryside over to factory farms. Our food will be unlabelled and GM, and the landscape; carefully husbanded by small famers; will run to ruin. The cost of living will rocket – thanks to the weak pound, and the threat of import duties. Personal and company insolvency will wreak havoc with lives. Is this what we want? We have an opportunity to use our native talents to innovate and create sustainable green jobs; particularly in areas where traditional industries are finished. We need to invest in Britain, and not let private foreign companies – who frequently don’t pay fair taxes – cream off the profits. ‘Shrinking the State’: has simply transferred power to Serco, G4S. and their like. Their income is greater than that of many countries. Yes – ‘Lets take back control’. We do want our country back; but we will have to cooperate beyond tribal-loyalties to re-gain it. An alliance to get rid of the Tories doesn’t work if you go into that alliance with a party that has already agreed to a coalition with the Tories. Voting LibDem is voting Tory. A progressive alliance requires that the group candidate #RecallGuarantee to propose / support or oppose as negotiated. I personslly refuse to vote for any stranger who reserves the right to act against their mandate and allways offer a progressive alliance. I had to stand against my Green candidate because they reserved the right to support Fracking and empower those who will.